Everything for a fuss-free holiday dinner for 10. A complete turkey dinner for six. Delicious desserts to please any crowd. A complete pot roast dinner for five. Get the party started with easy-to-prepare appetizers. A sampling of our highest-quality meats and seafood. Show stopping favorites for your party or theirs. Each handout can be printed and is customized specifically for your campaign. 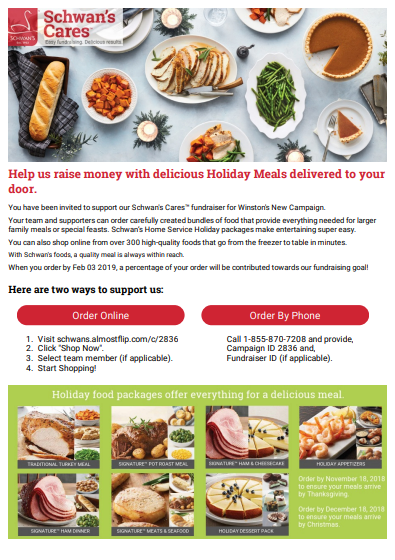 Pass this Holiday Meal flyer out to supporters to provide step-by-step ordering instructions. Pass this flyer out to supporters to provide step-by-step ordering instructions. Pass this flyer out to group members to provide step-by-step instructions on how to join your campaign to help spread the word. Send this code to your organization’s web administrator to embed on the page you would like this widget to appear on. Note: The widget is not able to be posted on social media sites.